Assange spoke about the latest tranche of documents from WikiLeaks in a 36-minute interview with TIME (the full audio will be available soon on TIME.com). He said there would be more: "We're doing about 80 a day, presently, and that will gradually step up as the other media partners step in." Indeed, every region of the world appears to be bracing for its turn in the WikiLeaks mill. Pakistani officials are almost certain that more revealing documents focusing on their country will come out soon. And the Russian media are anxious to see if future leaks will detail any behind-the-scenes dealings over the August 2008 Russia-Georgia war. Asked what his "moral calculus" was to justify publishing the leaks and whether he considered what he was doing to be "civil disobedience," Assange said, "Not at all. This organization practices civil obedience, that is, we are an organization that tries to make the world more civil and act against abusive organizations that are pushing it in the opposite direction." As for whether WikiLeaks was breaking the law, he said, "We have now in our four-year history, and over 100 legal attacks of various kinds, been victorious in all of those matters." He added, "It's very important to remember the law is not what, not simply what, powerful people would want others to believe it is. The law is not what a general says it is. The law is not what Hillary Clinton says it is." And the source or sources of all the diplomatic cables? Stengel asked Assange if U.S. Army PFC Bradley Manning, now detained in Quantico, Va., was the sole source of the megaleak. "We're a source-protection organization," Assange said, "so the last thing we would do is discuss possible sources. However, we do know that ... the FBI, State Department and U.S. Army CID [Criminal Investigation Command] has been going around Boston visiting a number of people there." He referred to "people who have been detained coming back into the United States" with connections to Manning. The U.S. soldier's "mother's home in Wales, in the U.K.," he said, was "visited, or raided, depending on how you want to describe it," by the FBI. Stengel asked what was coming next from WikiLeaks. "We don't have targets," said Assange, "other than organizations that use secrecy to conceal unjust behavior ... That's created a general target." A story in Forbes magazine, which interviewed Assange before the latest leak, said that WikiLeaks has a large U.S. financial corporation in its sights. Assange confirmed that. "Yes, the banks are in there. Many different multinational organizations are in the upcoming weeks, but that is a continuation of what we have been doing for the past four years" since WikiLeaks was founded. He added that the volume of material has increased. "The upcoming bank material is 10,000 documents, as opposed to hundreds, which we have gotten in the other cases." 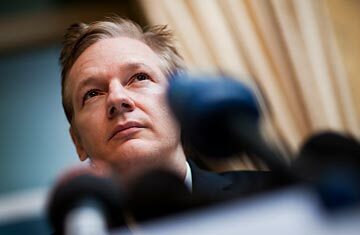 TIME and TIME.com will continue to report stories based on Stengel's Assange interview and on the continuing fallout from the release of the diplomatic cables. See how WikiLeaks has fueled anti-U.S. sentiment in Pakistan. See Assange and other candidates for TIME's 2010 Person of the Year.